I decided to step up my cooking game for Valentine's Day this year and try doing something different. 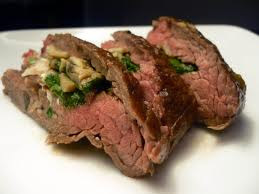 I have been making steak (or watching someone prepare it) since I could stand eye level to the countertops, but I have never "stuffed" anything besides a Thanksgiving turkey. So I knew this was going to be one for the books. The recipe that I based my version off of seemed bland, so I took the liberty of adding some of my own extra ingredients. Needless to say, this meal was outstanding. It was relatively easy to prepare and with the hour long roasting time, it left just the right amount of time to clean up a little bit and enjoy a glass of champagne with my Valentine. I highly recommend this for anyone who is trying to make a meal to impress. As easy as it was, it's presentation makes it look like you spent days preparing it. I also made beef flavored rice, grilled asparagus, and biscuits to accompany the steak.